When we welcome visitors to Paradise Meadows Orchard & Bee Farm, the home of Hawaii’s Local Buzz, one of the things they always enjoy is meeting our parrots. Our farm is home to six companion parrots, five of whom we have adopted as rescues. Each has its own personality and is very much a part of our family. Parrots are extraordinary creatures, but unfortunately many end up abandoned, abused, or improperly cared for. 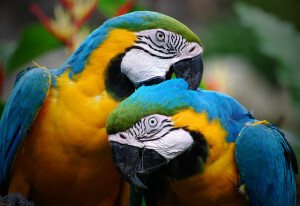 Parrots are highly intelligent and sensitive beings who require extensive attention and care, and the largest among them can live for up to 100 years, meaning that many are left without caregivers at some point in their lives. Even the smallest of our companion parrots can live to be 30 years old — something very few people realize when they purchase a budgie or cockatiel at a pet store. Because of their longevity, and of how challenging they are to care for, thousands and thousands of parrots have overwhelmed rescue organizations across the country. The Gabriel Foundation, based in Denver, CO, is one of the best of those rescue organizations. It is a non-profit, 501c3 corporation dedicated to rescuing and re-homing neglected, abused and abandoned parrots. Paradise Meadows donates to The Gabriel Foundation each year, and we urge those who are interested in parrots, or even in animal welfare in general, to do the same, or to donate to a similar rescue organization in your local area. Currently, more than 1,000 birds call The Gabriel Foundation home. Many of these birds will be adopted out to new homes, and the adoptive families will be given the support and education they need to provide good, loving homes for these birds in need. They (and we) encourage those who are interested in having a bird as a pet to adopt a rescue bird, rather than support the breeding of additional birds for the pet trade. And please be sure you’re ready for the challenges of providing a safe and secure “forever home” to a parrot before adopting (or buying) one. All donations that The Gabriel Foundation receives go towards caring for the birds in their care, finding good homes for those birds suitable for adoption, and towards improving the care that companion parrots receive in their community. You can give a general donation, or you can sponsor a specific bird. If you’re looking for a way to support animals in need, join Hawaii’s Local Buzz in supporting The Gabriel Foundation. Parrots are beautiful and intelligent animals, and by donating, you can help ensure that there is somewhere for the least fortunate among them to go when they’re in need of a home. Thank you for your comments, Ganiban. I do plan to write more about parrots in the future so keep an eye out for more. Parrots are a passion for us here at Hawaii’s Local Buzz, and we’re very appreciative of the work that organizations like The Gabriel Foundation do to care for the thousands of homeless (and often abused) parrots all around the country.